PT Energy Management Indonesia (Persero) - EMI or latter known as PT EMI (Persero) is a long standing state-owned enterprises (SOE) in Indonesia with principal business in conservation and energy management services. PT Energy Management Indonesia (Persero) was formed in 1987 and initially registered as PT Konservasi Energi Abadi (KONEBA). KONEBA is a joint venture between five state-owned fertilizer companies; PT Pupuk Sriwijaya (PUSRI), PT. Pupuk Iskandar Muda, PT Pupuk Kujang, PT Pupuk Kalimantan Timur (PKT) and PT Petrokimia Gresik. Later in 1993, KONEBA has officially operated as a state-owned company under the Government Regulation No 2 of 1993. 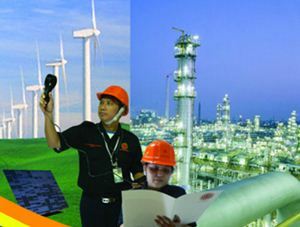 The name of PT Energy Management Indonesia (Persero) officially launched in 2006. PT EMI (Persero) is based in Jakarta and its principal office is registered at Jl Wolter Monginsidi No 4 / 6 Kebayoran Baru, South Jakarta 12160. Education background in Engineering and Business Management. Strong understanding and good knowledge about SMK3, OHSAS 18001 and Environment. Male, with the maximum age of 45 years old. Minimum 10 years of experience in same field and 2 years in same position. Education background in Engineering (Electrical or Mechanical) and Business Management. Strong understanding and good knowledge about SWRO, SMK3, OHSAS 18001 and Environment. JobsCDC.com now available on android device. Download now on Google Play here. Please be aware of recruitment fraud. The entire stage of this selection process is free of charge. PT Energy Management Indonesia (Persero) - Professional Hire Program EMI November 2016 will never ask for fees or upfront payments for any purposes during the recruitment process such as transportation and accommodation.